Formatting the hard drive on the PoC NVR only takes a few steps. 1. Start by moving your mouse to the bottom of the screen and clicking on the Settings icon in the bottom left of the screen as shown below. 2. 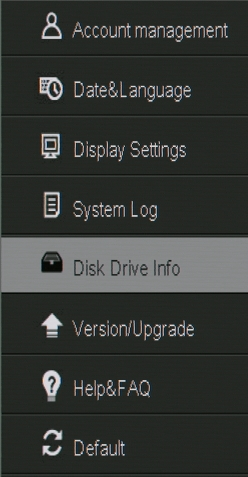 From the Main Menu, select General Settings icon as shown below. 3. Select Disk Drive Info from the list on the left hand side. The entire list is shown below with the Disk Drive Info selected. 4. The NVR will list the hard drive that it detects in the main section of the screen. A normally detected hard drive looks like the one in the image below. If your hard drive doesn't say connected or reports 0 total space, there is most likely a problem with the hard drive. 5. To format the hard drive, click on the Format button in the bottom right of the screen. This process will take anywhere from 1-5 minutes depending on hard drive size. 6. When the DVR finishes rebooting, your hard drive is formatted and ready for use. How or Why do I Format the Hard-Drive on my ZMD-DT-SFN6?